LIVE from Graham Sessions in Austin, Texas, I welcome Justin Moore on the show to discuss the American Physical Therapy Association. Dr. Justin Moore, PT, DPT, a physical therapist and veteran of both the profession and the association with more than 20 years’ experience, leads the American Physical Therapy Association in the role of CEO. He has been with APTA for 18 years and has held numerous positions, including executive vice president of public affairs, leading the public policy agenda and payment and communications departments, leading its federal and state affairs advocacy departments and serving as the association’s lead lobbyist on Capitol Hill. Justin Moore, PT, DPT, a physical therapist and veteran of both the profession and the association with more than 20 years’ experience, leads the American Physical Therapy Association in the role of CEO. He has been with APTA for 18 years and has held numerous positions, including executive vice president of public affairs, leading the public policy agenda and payment and communications departments, leading its federal and state affairs advocacy departments and serving as the association’s lead lobbyist on Capitol Hill. Moore also previously oversaw APTA’s practice and research departments. He has been honored for his contributions to physical therapy and public policy by receiving the R. Charles Harker Policymaker Award from APTA’s Health Policy and Administration Section and the Distinguished Service Award from APTA’s Academy of Pediatric Physical Therapy. In addition, Moore has written, presented, and lectured on health policy, payment, and government affairs issues to a variety of health care and business groups across the country. Moore received his doctor of physical therapy degree from Simmons College in Boston, Massachusetts, in 2005, his master of physical therapy degree from University of Iowa in 1996, and his bachelor of science degree in dietetics from Iowa State University in 1993. He was honored by Iowa State University’s College of Human Sciences with the Helen LaBaron Hilton Award in 2014 and the university’s Department of Food Science and Human Nutrition’s Alumni Impact Award in 2011, and he was the Family and Consumer Sciences’ Young Alumnus of the Year in 2003. He also recently completed a 3-year term on Iowa State University’s College of Human Sciences Board of Advisors. Moore was part of the inaugural Leadership Alexandria class in 2004 and served on the Northern Virginia Health Policy Forum Board of Directors. Karen Litzy: 00:01 Hey Justin, welcome back to the podcast. I’m so happy to have you back. So we have a couple of questions to get through today and we also want to talk about the first half of Graham Sessions. So we are recording live at Graham sessions in Austin, Texas. And I’ve got a couple of questions for you and then we’ll talk about your big takeaways from the morning session here at Graham sessions. So first thing is, and this will probably be addressed at Graham sessions tomorrow, but what is the APTA doing the American Physical Therapy Association doing to address the current needs of physical therapists, physical therapist assistants and students to ensure their membership is quote unquote worth it? Justin Moore: 00:44 Yeah, it’s a great question. It’s a question I get often and unfortunately don’t have always a great answer because it is such a personal and passionate issue of how do you find value inside this community of APTA. And as you know, value has two meanings, an economic meaning, do you get a return in your investment? And so we look at the physical therapist and the physical therapist assistant of investing in APTA and do they get a return, so there’s an economic part of this question, but there’s also a principal part. Do you value APTA? And we’d like to focus on that. And then how can we really engage the physical therapist and the physical therapist assistant and really showing value to APTA and getting value from APTA. And I sort of look at it in Adam Grant’s philosophy of give and take, you know, the transactional or economic value is what do you get from APTA? Justin Moore: 01:38 And then the give is what do you give to APTA? We’re really blessed by our members giving to us and increasing the value for all. And I think the value at the end of the day, the take home value that PTs get from APTA is we’re an unabashedly, aggressive about increasing the opportunities for physical therapists. So if you believe in that mission and that value, how do we continue to connect you to your colleagues? How do we continue to build a community that’s going to make this career you’ve chosen make a difference in people’s lives, but also return a fulfilling career to you. And so get that return on investment and that value. So, another thing I’ll just tie is our board of directors has been really aggressively looking at how do we continue to be relevant to the next generation of clinicians. And we know healthcare is changing. We know business is changing and we have to be getting better at being relevant at the point of care. We have to get better at promoting the value of our profession and we have to get better at connecting our experts. And right now, I think that’s what our strategic planning process is about, is how do we become more relevant to those individual clinicians and professionals. Karen Litzy: 02:50 And I think that’s different from a couple of standpoints. One and we’ll probably talk a little bit about this tomorrow, is that APTA is obviously a macro organization. There’s 101,000 members. So how do you incentivize members from one not dropping off, So a retention issue, right? And two, how do you attract them in to have that feel of more of a micro organization? Right? Cause it’s all about the details and it’s all about incentives. So how can the APTA, which is a very large organization and it needs to be that way. It can’t be small. So how do you give a macro organization a micro feel? Justin Moore: 03:35 Yeah, absolutely. It’s our greatest challenge. And I think, you know, one of the things that is very good about APTA is we interact with probably 95% of potential members in a five year period. So we have 80% market share of students, 30% market share of practicing professionals. It’s a little less than 10% of physical therapist assistants. So we do engage with almost our entire community over a five year period. But we have to return value in the short term to keep them a member. And the greatest challenges that is, how do you let this very diverse clinical community, how do you build a spirit and harness the power of inclusion? So people can find their people so they can find their community inside this large network of professionals. And sometimes APTA has been too complex, too fragmented, and too divisive to achieve that objective. Justin Moore: 04:29 And so we have to look at those themes on a pretty regular basis is how do we become more inclusive? And so how do we help people find their people, their network of individuals, because they’re going to get great value in that if they’re going to be a better private practitioner, if there going to be a better pro Bono clinic operator? If they can connect to their people that’s going to return value, how do we reduce the fragmentation? We all are committed to promoting the value of PT Well, if we’re talking about the value of a certain part of PT, we’re constantly competing inside the PT world. It really dilutes our impact. And we know that from data is we’re a pretty fragmented community. And so we’ve got to reduce that fragmentation and build unity. And have to be better working together. Justin Moore: 05:17 We’re not unified. The bigger you get, the harder it is to feel the intimacy. We had a consultant work with APTA’s board one time and he put up a matrix. He said, you can be three of the four things in the quadrant, but you can’t be the two things that are across from each other. And the two things that cross each other in that matrix were intimacy and strategic. And so to be a strategic organization, can you still be intimate in an association of one where you address every need, every one, and we have to figure out, we’re going to be a complex organization, but we have to figure out how to give an intimate experience, but be strategic in that intimate experience. Karen Litzy: And it’s a challenge. It’s a challenge for a large organization, but it’s good to hear that that’s on the minds of the people at APTA. Justin Moore: 06:06 Yeah. I think we’ve realized that we have fallen short at times of really being able to connect people, really giving people a sense of inclusion. Even though we’ve tried to be inclusive. If it is not conveying that to the end user or member and they don’t feel included then we’re missing the mark. Karen Litzy: One thing it’s not about is the money. 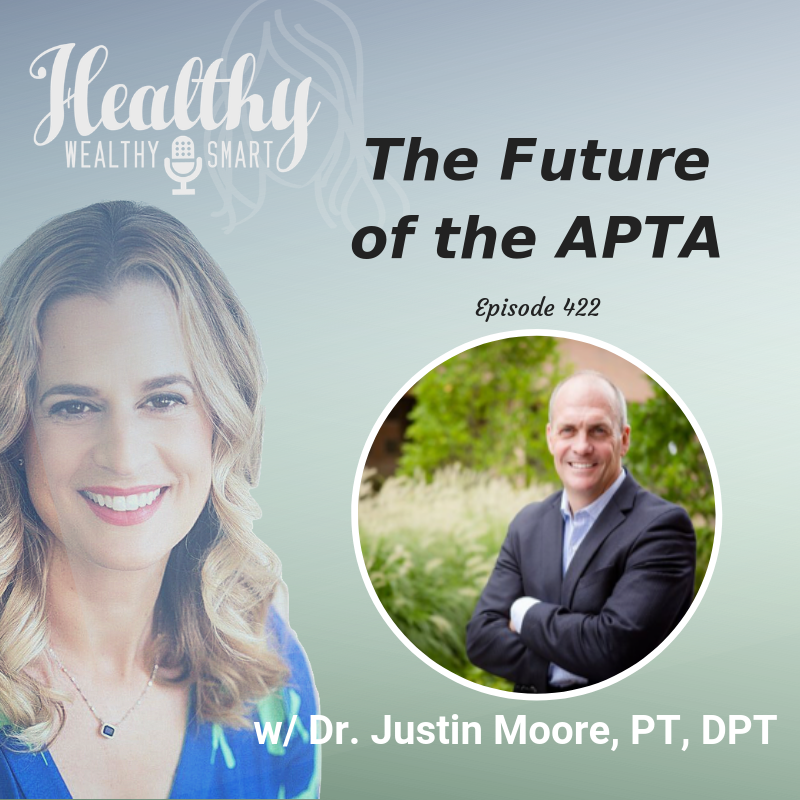 Justin Moore: We can give you in economics, I always tell the story is, you know, it is a federated model, has a complex new structure, but APTA dues are 295 in the realm of that, it’s a pretty low price point inside of professional associations. If you compare us to other medical associations, other nursing professions, it’s a pretty low price points. We probably return economic value for transactional value to the member, and show that value pretty well. But if they don’t value their experience, it doesn’t matter what the price point is. And so that’s what we really have to work to achieve. Karen Litzy: 06:59 Yeah. Not Easy. I look forward to seeing what comes out in the next couple of years there. Okay. Moving on. If you can end with, maybe we already said this a little bit, but if you can change one thing about the APTA organization, what would it be and why? Justin Moore: 07:13 I think it would be to harness the power of inclusion. We’ve really been focused on that and how do we create a community that at times has been competitive or fragmented and how do we bring them together for commonality and unification around promoting the value of PT, promoting the brand of PT and we’re going through a process right now at APTA of rebranding and we’re going to be launching that in the next 12 months. And what we found is we went through the research on doing that is we’re conveyed way too many opportunities to put your own perspective of what the value of PT is. And we need to really get unified and more inclusive in that march toward promoting our value. Karen Litzy: 07:57 Simplify the message a little bit more. It is hard because within physical therapy you have so many options of workplaces and how you work and who you work with and states and personalities. And I mean the list can go on and on. I would imagine having that sense of inclusivity among 101,000 members, but 300,000 PTs across the country is not easy when everyone is so diverse, diverse in race, religion, gender and diverse in practice settings. So it’s like you have to not be, I’m trying to do everything but a master of none. Justin Moore: 08:43 If you’re trying to do everything, you’re actually doing nothing. That’s sort of been a challenge for APTA. They’re trying to be all things to all people and was at times maybe a little bit mediocre at everything. So we really have to do that. And I think the common theme is we’ve done some analysis both on the data side and then actually a social listing. And two themes come out about the PT community is we’re pretty divisive. So when you guys see this is people like to tear other people down or can say that they’re better at a certain thing than others. So if we could get away from that divisiveness and correct that, that would be great. If an outsider was looking at our dialogues, it would not be a positive experience. Karen Litzy: 09:36 I’ve had a patient tell me like what you guys really don’t get along. I’ve seen some conversations on social media. And I was first of all shocked that a patient would actually bring that up so people are looking and they are reading. Justin Moore: 09:44 We’ve had outside consultants that have look at this and they said they can’t believe two things. How some of our acting members tear us down. And so these are people who have already made a decision to join us but yet like to tear down the organization. And then what we found is when we were out looking at the research on our next strategic plan and looking at net promoter scores our highest distractor group, was some of our longest serving members, and essentially we figured out we’re not engaging their expertise well enough. And so that was sort of a wake up call for us instead of saying, oh, why are former leaders tearing us down? We said, wait a minute, they’re feeling lost. They’re feeling not included. They have given a lot of time to this association and now they feel like they’ve been dropped off a cliff. And so how do we give them a parachute, how do we give them a glider? What can we do to keep them in the spirit of inclusion? Karen Litzy: 10:36 I think that’s great because you know, in some conversations I had yesterday, someone brought up to me that it was really great and it was that the APTA has 101,000 quote unquote experts. So the organization is not the expert. They’re the facilitators of all these experts that they have at their fingertips. And just think how much the organization can do by being a stellar facilitator of all those experts. Justin Moore: 11:05 APTA is a vehicle. We don’t practice, we don’t do research, right? We don’t do, we do a little bit of education. We do a little bit for professional development, but we can be a vehicle where our educators can educate, our researchers can publish, our researchers can have access to funding and our practitioners can get that. So we have to really leverage our role as convener. Our role as networker. As a funder. The very basic principle of association is people come together for collective success. So they give us dues you use to put into a collective operation for PR, for advocacy, for all those things. And we’ve got to get better at that. Include that spirit of inclusion. Karen Litzy: 11:46 Perfect. Alright, next question. So the World Confederation of PT Conference is coming up in a few months in Geneva in May. So how is the APTA improving its outreach and involvement in the international world of physical therapy? Are you going to be in Geneva? Justin Moore: 11:54 Yeah, it’s a big priority for APTA to be an international partner and contributor to global PT. And so WCPT is one part of that. It’s not our inclusive effort. But APTA has a long history of involvement with WCPT including being one of the founding countries and including having at least a couple of presidents I believe. So, most recently, Marilyn Moffat was president of the WCPT. So we have a longstanding commitment and contribution to WCPT and the conference in Geneva will be a great community of international leaders where we can go and be in a posture of learning. So a lot of times we’re not going to, we go and have a delegation at WCPT, but we’re really going to interact with our colleagues in Australia and the UK and the Netherlands and really learn from their successes and how we can apply those back here. Justin Moore: 13:01 I think this morning at the Graham sessions when we heard T.R. Reid and it’s a great book. I highly recommend it, but he went around and experienced healthcare in different countries. That’s sort of what we do at WCPT. We go and we talk to the Netherlands of how did they stand up their registry? How did the UK be frontline in primary care, how did Australia get this great expertise in sports and orthopedics and manual therapy? And so what can we do to really leverage that global community to improve care back in the US as well. WCPT is just like APTA, it’s an organization. And so we have a responsibility as a member. It’s interesting, WCPT doesn’t have members that are individual physical therapists. Their membership is the organizations that comprise the countries. Justin Moore: 13:49 And so we are one of about over a little over a hundred member organizations at WCPT and we, you know, we take that responsibility very seriously and always are looking for opportunities to contribute to their objectives and especially when they’re aligned with our objectives. Karen Litzy: I’m looking forward to going to Geneva. I can’t wait. I think it’s going to be awesome and I’m actually going to be staying with some international PTs. So one from Canada and one from Ireland. I go to a lot of international conferences. It has really changed the way that I practice, it has changed my outlook on the profession as a whole. And what you find when you talk to therapists from different countries, we’re not all that different. The way we practice, the challenges that we all have in these different countries are very similar. And I found that to be very eye opening. Justin Moore: As a physical therapist who’s gone into association management, I’ve gotten huge value from some of my colleagues of other physio therapy associations. Justin Moore: 14:46 So Cris Massis at the Australian physiotherapy association, he’s just been a great role model. Someone to learn from. And it’s nice because it’s safe. You know, we’re not competitors. He’s got his lane. I got my lane and he’s been a great resource. 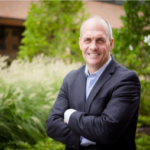 Mike Brennan, who was at the Canadian Association a few years ago has been a great reference and resource and I’ve just been able to observe a lot of these international CEOs and how they conduct their business. And it’s been a great learning opportunity for me as well, a little different clinic than the practitioners. Karen Litzy: 15:20 The parallels are there and the APTA, we’re as clinicians trying to learn from each other and as heads of organizations you’re trying to learn from each other. Justin Moore: It’s one of the strongest things is the opportunity to interact with those other CEOs. Karen Litzy: So before we finish up, what were your biggest takeaways from the morning here at Graham sessions? Justin Moore: Well, I thought my biggest takeaway, or I don’t know if it’s a takeaway or my biggest observation is a lot of thought provoking conversations are already starting. And this concept, and we’re going to face this all the time, this concept of what is next in healthcare reform that was started by a T.R. Reid’s presentation, but also what does that mean for physical therapy and where do we need to change our lens? Where do we need to change our focus and how do we need to adapt to be part of the solution, not part of the problem was a key theme. There’s a lot of brains in that room, and so I’m looking forward to how they process over the next several hours and come up with solutions. It’s easy to point at the problems, but the solutions are always more complex. Karen Litzy: 16:29 So thank you so much for coming on.